Constructed in 1857, Wat Ming Muang is a much more recent temple than Wat Phumin, but well worth adding to any old town tour by virtue of its spectacular and highly elaborate decorations. The exterior of the main hall is covered with finely crafted, white painted, stucco reliefs with Buddhist themes while the interior walls are coated with mural scenes of everyday life in Nan. These are a recent addition by local artists so they gaudier than the ancient Phumin ones but interesting nonetheless. The intricate white coloured exterior is somewhat reminiscent of Chiang Rai’s famous Wat Rong Khun. 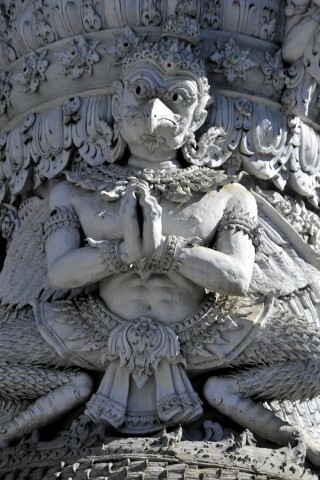 The temple grounds are also home to the city pillar, a three-metre column topped by a four-faced image of Brahma. This is a good spot to fit in around lunchtime since it’s just down the street from the excellent Hot Bread.